If your cluster is configured with redundant power supplies for your nodes, you must be sure to configure fencing so that your nodes fully shut down when they need to be fenced. If you configure each power supply as a separate fence method, each power supply will be fenced separately; the second power supply will allow the system to continue running when the first power supply is fenced and the system will not be fenced at all. To configure a system with dual power supplies, you must configure your fence devices so that both power supplies are shut off and the system is taken completely down. When configuring your system using Conga, this requires that you configure two instances within a single fencing method. To configure fencing for a node with dual power supplies, follow the steps in this section. Before you can configure fencing for a node with redundant power, you must configure each of the power switches as a fence device for the cluster. For information on configuring fence devices, see Section 4.6, “Configuring Fence Devices”. Click on a node name. Clicking a link for a node causes a page to be displayed for that link showing how that node is configured. On the node-specific page, click Add Fence Method. Enter a name for the fencing method that you are configuring for this node. Click Submit. This displays the node-specific screen that now displays the method you have just added under Fence Devices. 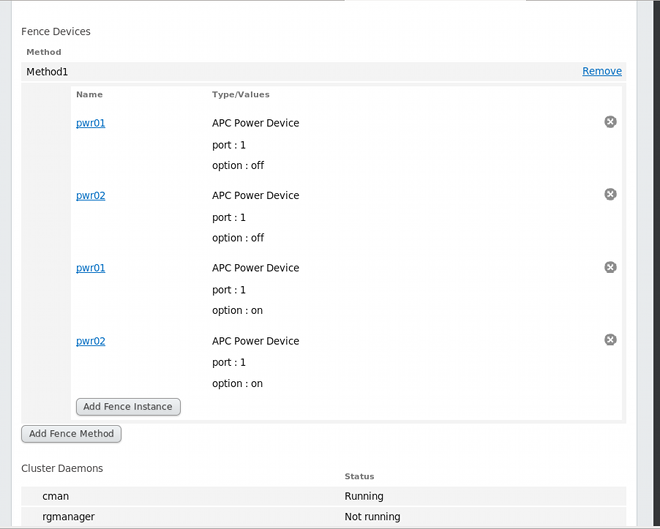 Configure the first power supply as a fence instance for this method by clicking Add Fence Instance. This displays a drop-down menu from which you can select one of the power fencing devices you have previously configured, as described in Section 4.6.1, “Creating a Fence Device”. Select one of the power fence devices for this method and enter the appropriate parameters for this device. Click Submit. This returns you to the node-specific screen with the fence method and fence instance displayed. Under the same fence method for which you have configured the first power fencing device, click Add Fence Instance. This displays a drop-down menu from which you can select the second power fencing devices you have previously configured, as described in Section 4.6.1, “Creating a Fence Device”. Select the second of the power fence devices for this method and enter the appropriate parameters for this device. Click Submit. This returns you to the node-specific screen with the fence methods and fence instances displayed, showing that each device will power the system off in sequence and power the system on in sequence. This is shown in Figure 4.7, “Dual-Power Fencing Configuration”.